This Multi-Pack combines our three best products for sleep and stress management so that you can get the restful sleep you need even in times of high stress. N3 and Passion Flower can be taken during the day or night and help you stay calm on stressful days. If you have any issues completing your order, please contact Beverly for assistance. 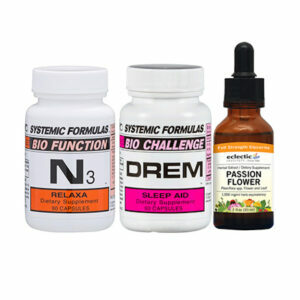 Systemic Formulas DReM Sleep Aid contains tryptophan, melatonin, GABA, and herbs to promote healthy sleep and relaxation. Dosage: 1-2 capsules at bedtime. Allow 8 hours for sleeping. 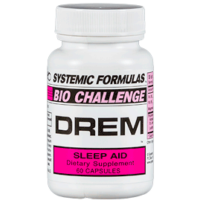 DReM Sleep Aid – Ingredients (60 capsules): 5 mg. Melatonin, Astragalus (Root); L-Tryptophan; Passion Flower (Herb); St. John’s Wort (Herb): Cat’s Claw; Stevia (Leaves); Tayuya (Root); Devil’s Claw (Herb): Valerian Root (Extract); Lecithin; Licorice (Root); G.A.B.A. ; Kava Kava (Extract); L-Glutamic Acid; 5-HTP in a Gelatin capsule with Leucine. Also contains: 11 mg Calcium (Carbonate, Pantothenate, Ascorbate), 5.6 mg Vitamin B5 (Pantothenic Acid), 4.5 mg Vitamin B6 (Pyridoxine HCl), 4 mg Vitamin C (Ascorbate). Read more about DReM – Sleep Aid here. 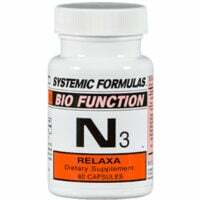 N3 Relaxa – Recommended Usage: 1-3 capsules up to twice a day. This product contains vitamins and calming herbs for pain, sleep and stress management. A proven formula for more than 40 years, take it day or night as needed, with or without food. This product causes drowsiness but one capsule will not put you to sleep. N3 Relaxa – Ingredients (60 capsules): Tayuya; Blue Vervain; Valerian Root Extract; Senna Leaves; dL-Methionine; Passion Flower Extract; Calcium Chelate; Saw Palmetto; Sete Sangrias; Mandrake Root; Mormon Tea; Tyrosine. Read more about N3 – Relaxa here. Take as desired 10 to 40 drops up to 3 times daily. Fresh certified organic Passiflora spp. leaf & flower. Kosher Vegetable Glycerine – 80%. 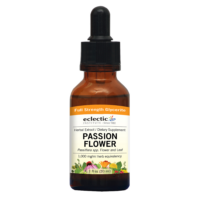 Read more about our Passion Flower in Glycerin here.